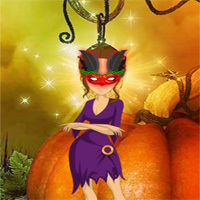 G2R Halloween Party Mask Escape is another point & click escape game developed by Games2Rule. In this game, a girl is missing her Halloween party mask - she lost it in a Halloween forest. Your aim is now to help the maid retrieve her disguise by discovering useful objects and hints to solve puzzles. Click on the objects to interact with. Good luck and have fun! Thanks Anna for the last bat. I am stuck in the second set. can't find any hints. can't get the skulls in piles of 3? Ginner have you seen the clue? through the next scenes. Tough one. Stuck near end I believe. Finally spotted wonky stick for the white skulls. It was at last door next to green and red devil.